I departed on a Sunday morning in May from Okinawa’s Tomari Port (see sidebar below), which was crowded with tourists of different nationalities. I could hear them speaking English, Chinese, French, Korean, and Japanese. Some held snorkeling gear, while others had underwater cameras in hand. And, although they may have spoken different languages, they all had the same thing in mind: crystal-clear blue waters around the Kerama Islands. Often referred to as “Kerama Blue,” the exceptional color of the ocean has been drawing many tourists to this group of around 20 islands, 24.9 miles to the west of Naha. 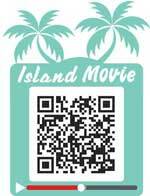 I purchased my one-way ticket to Aka Island for 2,220 yen with tax from the counter. That started the cost calculator in my head. 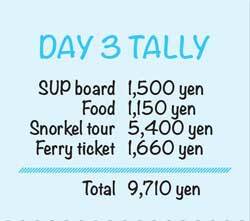 The goal of my trip was to tour Aka, Zamami, and Tokashiki islands over three days, and to spend less than 30,000 yen. The ferry departed at 10 a.m. as scheduled, and my adventure had begun. The ferry to Aka Island went much more smoothly than I had thought. If this were in winter, the waters between Naha and the Kerama Islands would be very rough. The sky was clear with the sun glaring. It was hard to believe that the rainy season had just started five days prior. I made my way to the cabin, which was close to fully occupied. Although it was supposed to be an off-season, the number of the passengers was telling a quite different story. 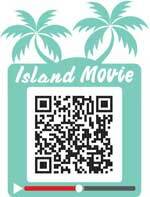 There seems to be no break for the popularity of Kerama Islands. I sat facing the right side of the ferry and watched as we passed a few small islands, including Nagannu. After an hour, bigger islands came into view, and before I knew it, the Kerama Islands were right there. As the ferry approached Aka Island, my first destination, the view of a bridge between Aka and Geruma islands came into focus. Under the bridge, the turquoise blue water shined, presenting a much different layer from the waters in deep blue that I saw in the outer sea. The ferry docked at Aka port at 11:30 a.m. - right on time. The moment I hit the ground, the calmness of the island was pretty striking. Within five minutes, I could hardly see anybody around the port. It was a fresh view for someone used to the noisy environment on the main island. After buying my ticket for a boat ride to Zamami Island, I headed to a local store near the port to rent a bike. With no bus or taxis available, tourists typically rent a moped or a bike for transportation on the island. In my case, renting a bike for five hours at 1,000 yen was an easy decision. A moped would have been 2,500 yen for three hours. 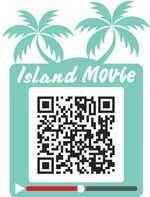 Aka Island is known for having beautiful beaches (see sidebar below). 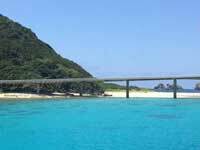 For tourists who expect beautiful views of the sea the most, going south on Aka Bridge to visit Geruma and Fukaji Islands may not be their first choice. The coastline of these islands are mostly covered with rocks and pebbles, leaving little space for sandy shore. Still, touring those islands provide great opportunities to see natural beauty. Fukaji Island offered dynamic views. This uninhabited island had an observatory, which offers a view of Tokashiki Island as well Geruma and Aka Islands. Walking uphill for 10 minutes, I was exhausted by the time I reached the spot. But, it was worth it to get the view of the different rocks off the coast. 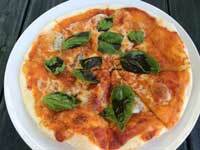 I returned to Aka Island shortly after 2 p.m., so lunch was already over at some restaurants in the area. My Margherita pizza lunch at a café was unexpectedly interrupted by a Kerama deer, which showed up in Aka town (see sidebar below). As if to check on tourists or the food, the wild deer was hanging around in a shade near the café. The local town mostly consists of old houses along small streets. Just like towns on the main island, there were traditional Okinawan houses with red-brick roofs or those with Shisa Dogs sitting at the entrance. However, the town also had an atmosphere of a resort city in a foreign country. It may be because of the colorful wetsuits hung on the walls of dive shops or the couple of new lodges spotted in the town. But what stood out was the contrast between the sea and sandy shores and the white walls and red ceilings of the structures. With the strong sunlight making each color vibrant, the view felt like a Mediterranean city. 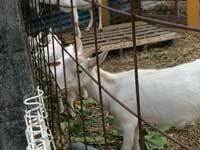 As I walked around, another unexpected encounter occurred. It was at Aka Beach, about a 10-minute walk from Aka town. After hearing a fellow tourist get excited, my attention was drawn to a sea turtle popping its face above the surface of the water. Unlike the deer, the sea turtle was gone without giving me a chance for photos. I remained there for a while, but the turtle didn’t return. With the deer and sea turtle encounters behind me, my time on Aka was coming to a close. It was time to head over to Zamami Island. The last boat of the day departed Aka port at 6:10 p.m. with six passengers. With the sun quickly moving to the horizon, the boat sailed in an orange light. The waters were still peaceful. It was a short 15-minute ride, but it became very dark by the time we arrived on Zamami port. My first stop on my next island would end up being my final for Day 1: Zamami International Guest House. 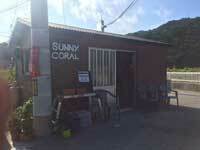 My lodging was located right in the middle of Zamami town – less than a five-minute walk from the port. On the outside, it had a look of a local Okinawan house and pop art mixed together. An Orion Beer lantern hanging under the eaves and Shisa dogs sitting at the entrance gave the building the vibe of a local inn, but brightly colored signs at the door made it look hip. The interior was adorned with artifacts such as fishermen floats, shells and photos of the sea. It was in the lobby that I had dinner. After walking all day, I didn’t feel like going out to look for another place to eat. It was a choice I made out of a necessity, but the “Classic Burger” I had for 950 yen proved it was the right call. The home cooked hamburger was a good size and was tasty. 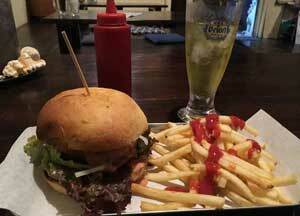 The burger with French fries and jasmine tea was rejuvenating. By 10 p.m., everybody seemed to have gone to bed at the inn. Lights were turned off and music silenced. Given the location in town, it was understandable. The dormitory style room I stayed in was clean and cozy. For 2,730 yen, it was a good deal. Although there are several beautiful beaches on the island, Nishibama beach is the only one approved by the Zamami village office for water activities. It takes about 20 minutes to walk to the beach. Aka Beach (Maja no Hama) is known as a place where there is a good chance of encountering sea turtles. But there are no lifeguards or shower rooms available on site. Designated as a protected species, the Kerama Deer are one of the smallest deer in Japan. Aka, Geruma, Fukaji and Yakabi islands are the locations where they live, and some of them will swim in the ocean. 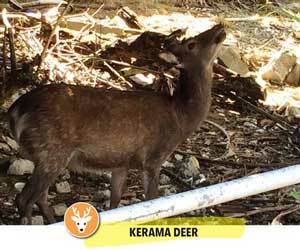 Although deer are normally cautious of humans, Kerama Deer are often seen around town. This boat connects Zamami, Aka, and Tokashiki islands four times a day. Reservations are required depending upon what time of a day it departs. It costs 300 yen between Aka and Zamami islands, while it costs 800 yen between Zamami and Tokashiki islands. If you have a tent, the cheapest place to spend the night on Zamami Island is a campground near Ama beach. It’s 300 yen for adults and 150 for children (6-12 years old). The campground also has kitchens, bathrooms and showers. Tents can be rented at the location as well. Camping is prohibited at other locations on the island. Visitors are required to be quiet on site starting at 9 p.m.
From this port, one to two ferries bound for Aka/Zamami depart. 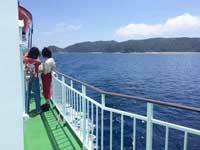 There are also ferries to Tokashiki Island. Ticket counters are set up separately between these two destinations. A ferry ticket from Tomari to Zamami is 2,220 yen, including environmental tax. If purchased as a roundtrip ticket, it’s 4,130 yen. 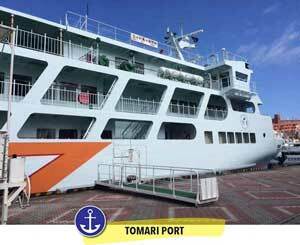 To go to Tokashiki from Tomari by ferry will run you 1,760 (3,260 round trip). 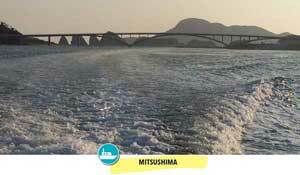 There are also high-speed boats available between the island and the port, which run 3,240 and 2,590 yen, respectively. Clerks speak English at ticket counters. With night No. 1 in the books, I left the inn around 9 a.m. With one hour left before a snorkeling tour I booked, I took a walk through the Zamami town. In the daylight, the town looked even smaller than it seemed the day before. On the outside, it had the same look as Aka town. But somehow, Zamami has a more exotic atmosphere. 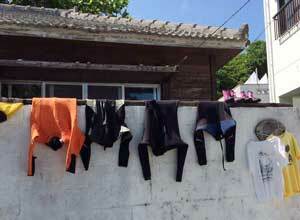 After having toast and butter at a café for breakfast, I headed to the dive shop. It was time to go under the water. It cost me 5,700 yen to join the tour, but since I was traveling alone, it was a choice I made out of safety. 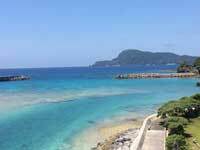 The snorkeling spot was a five-minute drive from Zamami port. Under the sunny sky, the boat I took cruised quietly through the sea. As soon as I went under the water, a vast carpet of coral came into my view. In a sunlight that rippled through the prism of the water, the countless branches of coral presented a distinct look. So did tropical fish in various colors. There was a school of blue fish that went by the branches. On the other hand, a Moorish Idol was swimming alone gracefully. I could also see several clownfish hiding in between sea anemones. My excitement peaked when I encountered two sea turtles. One of them was staying at the bottom of the sea seemingly eating seaweed. Several tropical fish were staying on the side, as if to expect a small share. The other one swam alone gracefully. The tour ended around noon. I made a stop at a store nearby and bought a “Marlin Bowl” and a “fish meat sausage” (550 yen), and ate them by the port. As I was enjoying the texture of fresh meat of the fish, I thought about my game plan for the afternoon. During the snorkeling tour, a tour guide told me that Zamami Island had earned two Michelin stars a couple years ago for the beauty of Furuzamami Beach (see sidebar below). Leaving the island without seeing the beach didn’t sound like a wise decision. So, I rented a moped and headed to Furuzamami Beach. It was my plan to see the beach from ashore, and then tour other parts of the island. But once taking a look at the beach, I changed my mind. The beach almost looked like a blue cocktail served up by nature. Looking at the unbelievably clear water, I could not resist my instinct to get in, like a kid can’t fight his appetite for candy. After renting a snorkel, mask and fins, I got in. Under the water, I could see tropical fish swimming all around me, while the crystal-clear water dazzled me above and below the surface. In the afternoon, I took the ferry Mitsushima for the second time. 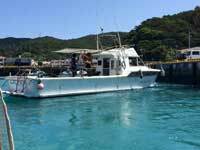 From Zamami port to Tokashiki Island, it was a 40-minute boat ride (800 yen). 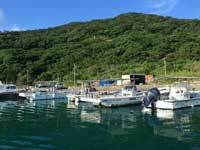 When it arrived at Aharen Fishing Port on Tokashiki Island at 5:30 p.m., the sunlight was still strong and hot. My first impression of Tokashiki Island was that it was big. I knew from looking at a map that Tokashiki is the biggest of all the Kerama Islands. But the hilly landscape, which can be seen from the port, looked overwhelming after having toured smaller islands. Tokashiki Island is hard to get around without a car. The owner of Kerama Backpackers (see sidebar below), a hostel I was going to stay at, picked me up at the port. The lodging was about a 20-minute drive away. On foot, it would have taken an hour. 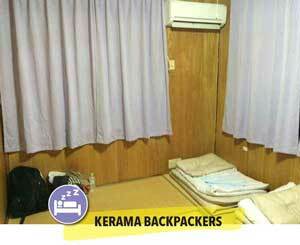 Kerama Backpackers was similar to Zamami International Guesthouse in some ways, but the mood was very different. 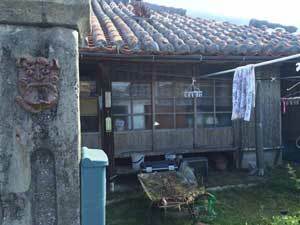 The hostel on Tokashiki Island was a lot like a regular Japanese house. I shared a tatami room with a couple of other travelers, and just like staying at someone’s house, there were rules visitors needed to follow. The owner and staff were very friendly, and I soon got used to being in the Japanese-style inn. By the time I finished taking a shower, it was already dark outside. Afterwards, I ventured out in search of food. 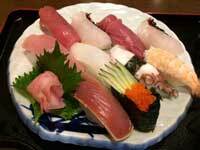 Although many stores were already closed, I managed to find a restaurant near Tokashiki port and had a sushi plate. Being in a fishing town, it seemed like the right thing to do. Later that night, I exchanged information with my roommates. Most of them had already spent a couple of days there, and had a better idea of how to get around. The night was sweltering. Luckily, the air conditioner in my room worked OK. According to the Zamami Village website, the beach earned two Michelin Green Guide stars. Its 1 km stretch of white sandy shore is often dotted with colorful beach umbrellas and presents a picture-perfect scene. 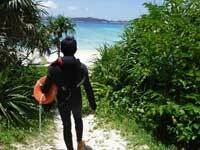 It is regarded as a good place for snorkeling and diving, and has a bathroom, shower room, and food vendors. 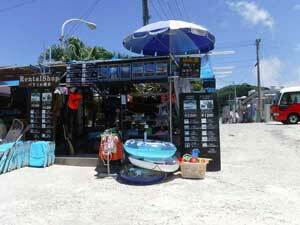 Items such as beach umbrella (1,000 yen), lifejacket (500 yen), snorkel mask and fins (1,000 yen) are available for rental. The rental shop can also hold luggage for visitors. This beach is a 20-minute walk from Zamami port. Many tourists visit there for the calmness of the sea. There are sea turtles living around the beach. Located in the western part of the island, people can enjoy a beautiful sunset there. There is a campground nearby. 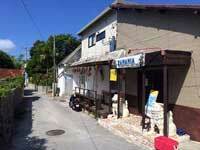 There are many restaurants, cafés and shops on Zamami. Some of them serve up local food such as soba noodles, seafood bowls and bento meals, while others offer western food such as pizza and pasta. Places such as Zamami International Guest House or La Toquee are popular among tourists from foreign countries and are known as good places to have a drink. There is a campground near Aharen Beach where facilities such as bathrooms, showers and kitchens are available. A one-night stay will run 500 yen for adults and 250 for minors. The following morning, I took a walk and found a small café along the way. I had two rice balls and a cup of espresso for breakfast. Starting the final day of this trip, I had two destinations in mind: Aharen and Tokashiku beaches (see sidebar below). On foot, it could take an hour or more to go to those beaches from Tokashiki town, where I was staying. Thankfully, a staffer offered me a ride to Aharen Beach, which took about 20 minutes or so. The location was right next to the port where I landed the previous night. Shortly past 9 a.m., there were already tourists on the sandy shore. Standing at the northwest end of the beach was Kubandaki Observatory, which commands a good view of the location. That’s where I went first. The route leading up to the viewpoint was surrounded by interesting landscape. First, I went through a huge rock tunnel, and continued under a long arch of trees before getting to the bottom of the observation deck. The ocean looked beautiful from the viewpoint, reminding me of other beaches of Kerama. 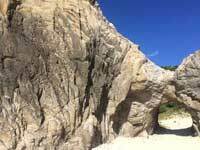 But Aharen Beach looked more dynamic with jungles and huge rocks surrounding it. Along the beach, items for banana boating, sea kayaking, and snorkeling were available to rent. Looking to do something different from the previous days, I rented a stand-up paddleboard for 1,500 yen for an hour. By the time the one-hour SUP session was over, I was very hungry. Luckily, there were many restaurants along the beach. I had curry rice (650 yen) at one of the restaurants as I thought over what to do in the afternoon. There were only four hours left before leaving the island. My original plan for the afternoon was to snorkel at Tokashiku Beach, which was a 10-minute drive away. After seeing the crystal clear water as I was paddling on the board, I was leaning toward remaining at Aharen and exploring under the water. But I did not want to leave the island without seeing the other beach. So I stuck to my plan. 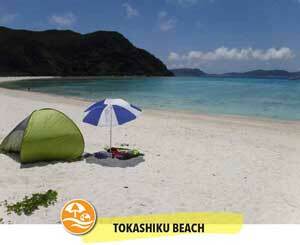 For advanced swimmers or snorkelers, Tokashiku Beach won’t be difficult to explore. I could see many tourists swimming on their own. 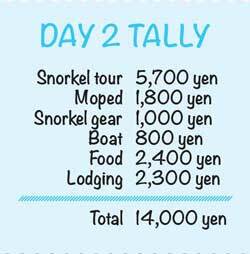 In my case, I signed up for a tour (5,400 yen) to locate coral reefs or marine creatures without wasting time. 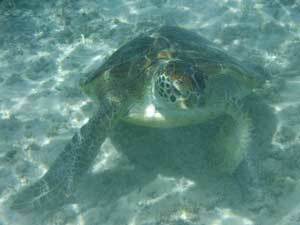 When I saw sea turtles on the previous day, I could not get close to them. But this time, the creature was right in front of me. Staying at the bottom of the sea not far from the shore, it seemed to be eating seaweed. As I was pointing my camera at it, the creature suddenly started swimming upward. I followed the move with my camera. When the creature lifted the tip of its face above the water, my view came above the surface as well. The breathtaking moment was captivating. I couldn’t stop taking photos and shooting videos. By the time the tour was over around 2:30 p.m., my camera battery was dead. After 4 p.m., I was on Ferry Tokashiki cruising smoothly eastward. The sky stayed clear and sunny, and the cabins were close to full capacity. Passengers spoke in different languages – very similar to the scene I had witnessed two days prior. A ferry ticket from Tokashiki to Naha (1,660 yen) was the last purchase I made during the trip. My wallet became a little lighter than it had been for sure. My goal had been to spend less than 30,000 yen, and I came close. But, in the end I spent a total of 32,539 yen on my journey. There are definitely ways to make your trip cheaper if you choose. 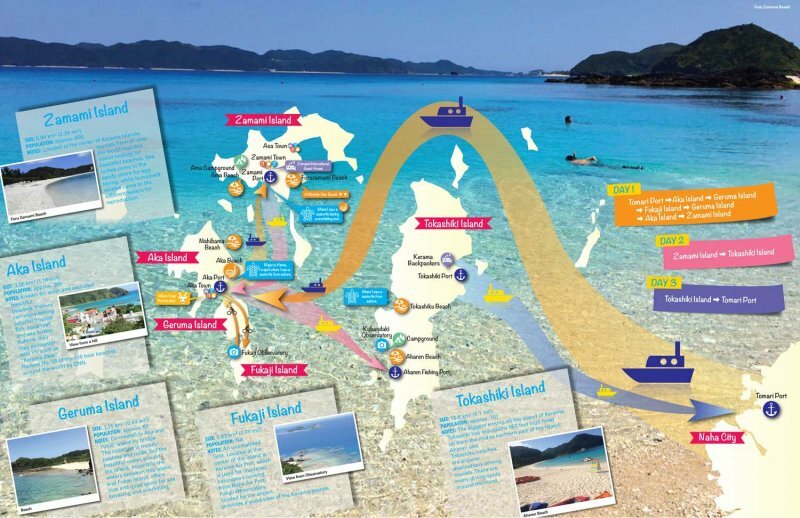 Hopefully you can use this as a guide to planning your next Okinawan island adventure. On the ferry ride home, I reflected on the past three days, and didn’t worry about the cost. As I watched Kerama Island get smaller and smaller, my mind only focused on all the priceless memories I had just made. Arguably the most popular beach on Tokashiki Island. There are rental stores on the beach for gear such as snorkel, masks, fins, beach parasols, SUP boards, and sea kayaks. There are also cafés and restaurants on the beach. This is a popular snorkeling spot where the sea is calm and many coral reefs can be seen. From Kubandaki Observatory at the northwest end of the beach, people can enjoy the entire view of the beach and also beautiful sunset. 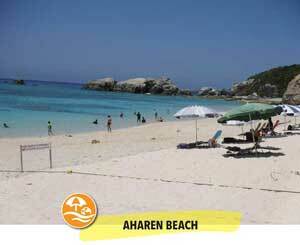 About a 10 minute drive from Aharen Beach, this beach is known as a good place for snorkeling. 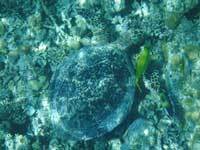 Sea turtles are often seen eating seaweed on the shoal, which runs for about 490 feet from the shore. Unlike Aharen Beach, there are not many buildings around the area except one hotel. So there is a secluded or quiet mood there. Many areas on the island are hilly. So it takes a lot of time to move around on foot or by bike. Rental cars and mopeds are available for about 3,000 yen and 1,000 yen per hour, respectively. There is a bus that runs between Tokashiki port and Aharen beach, which costs an adult 400 yen and a minor 200 yen.